The wire rope is an important part of the cable seals, let us through this article to get a preliminary understanding of it. With a number of strands or more stranded wire twisted into a flexible rope, wire rope is twisted by the multi-layer wire, and then to the core as the center, by a certain number of shares twisted into a spiral rope. In the material handling machinery, for lifting, pulling, tensioning and carrying the use. The high strength of the wire rope, light weight, work smoothly, not easy to break the whole root, reliable work. 1. 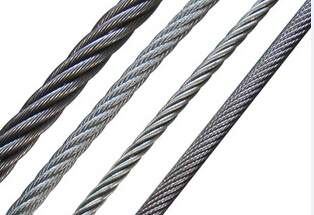 Wire: wire rope to bear the role of load, its performance is mainly determined by the wire. Steel wire is made of carbon steel or alloy steel by cold drawing or cold rolling round (or shaped) wire, with high strength and toughness, and according to the use of different environmental conditions on the wire surface treatment. 2, the core: the core of the main role is to increase the rope elasticity and toughness, lubrication of steel wire, reduce friction, improve the service life of wire rope. Commonly used cord types include organic fibers (such as hemp, cotton), synthetic fibers, asbestos core (high temperature conditions) or soft metals and other materials.